Laura Lewis, NP; Bridget Long, Staff Assistant; and Meg Hardy, NP -- all with Duke Colorectal Surgery -- are all smiles this chilly morning. Martin Kowalsky, Pharm D, pharmacist with Duke Cancer Investigational Chemotherapy Service and his son Ethan are up and at 'em. Executive director of Duke Cancer Institute Michael Kastan, MD, PhD, and emeritus DCI faculty member and oncologist Herbert Hurwitz, MD, were pleased to hear that CRUSH participants and supporters raised more than $80,000 this year. CRUSH 2018 was held for the first time at Durham's Northgate Mall. Hope Uronis, MD (right) cheers on her patient Charlemagne Asekhauno, currently undergoing treatment for colorectal cancer. Charlemagne has a sweet ride for his first CRUSH event. Team Cross-Check Your Colon is supporting their friend Charlemagne. There were 50 plus dogs here today with the Cecum Seekers, a Duke GI team. Ryan Fee (Fee Fighters), Callum Coysh (Team Semi-Colon), and Matt Kirby (Fee Fighters) cross the finish line! Sarah Coppolino, PA, and Amy Karan, RN, from Duke GI Brier Creek bring up the rear in the CRUSH 5K. Doug Jamison of team We Love Lucy and John D. Wilson of Team Semi-Colon, keep pace. Another CRUSH run completed for colorectal cancer survivor and CRUSH emcee Ryan Switzer. Team Semi-Colon rallies around Ryan Switzer. Duke Gastroenterology Administrator Cathy O'Neill (right) and Elizabeth Goacher, PA-C, MHS (GI APP Leader), take to the podium. O'Neill ran in honor of cherished friend Lynda Mohlenhoff. Goacher ran in honor of her cousin-in-law Joe Don Hilliard. Claudia Graham, MBA, MPH, community advocate; Joshua Alexander, NCCU student; Faiza Mustafa, MPH, and Kearston Ingraham, MPH, are here to help. Patient advocate Xiomara Boyce and Renacer volunteer Ana Karina Jordan welcome CRUSH participants. Durham County Public Health colon cancer screening working group's Chelsea Hawkins and Latoya Garrett are at CRUSH 2018 with a wheel game and raising awareness! 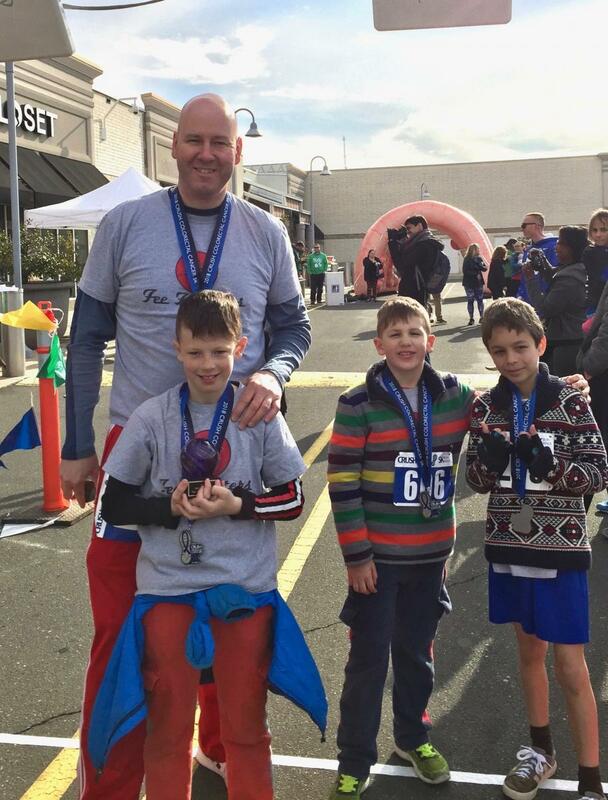 About a thousand people and 50 plus dogs rose early on Saturday morning, March 24, to attend an unseasonably cold CRUSH Colorectal Cancer 5K and Fun Walk — held for the first time at Durham’s Northgate Mall. 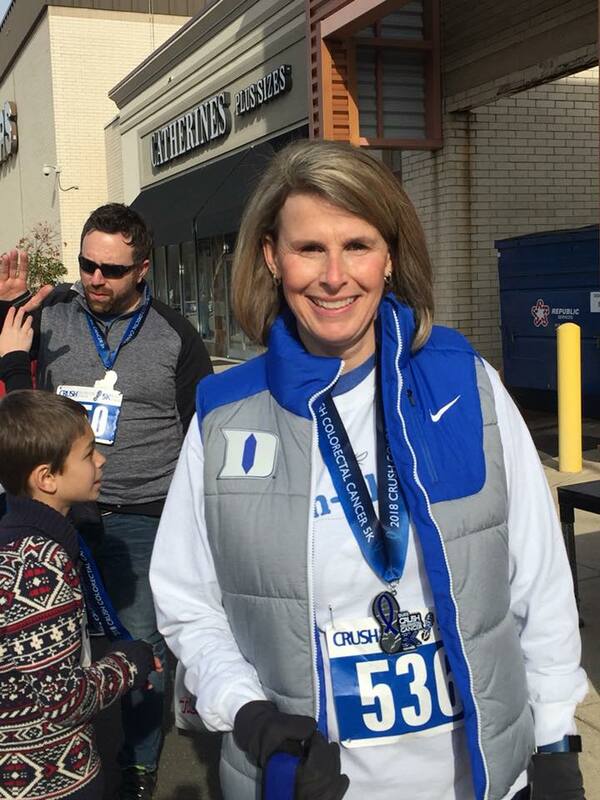 The spring freeze couldn’t crush the team spirit that rippled through the event, organized annually by the Duke Cancer Institute Gastrointestinal Cancer disease group for the past five years. More than $81,000 was raised by 45 teams to improve colorectal cancer treatments and raise awareness for prevention and early diagnosis. The event honored and celebrated those whose lives have been touched by colorectal cancer. According to the American Cancer Society, colorectal cancer is one of the most common cancers in the U.S. Of cancers that affect both men and women, it was the second leading cause of cancer-related deaths in the United States. Recent advances have significantly contributed to improving screening and treatment, and have resulted in a growing population of colorectal cancer survivors. Physicians advise that men and women, aged 50 and older, should be screened for colon cancer — earlier, if there is a family history of the disease. Charlemagne Asekhuano, 40, rented a motorized 3-wheeler at the mall. He decorated it with his “Cross-Check Your Colon” team poster, and packed some snacks for the road. Still in recovery from his latest chemotherapy infusion a few days before, and with the morning’s cold weather “not helping,” he said just didn’t have the energy to do the 5K under his own steam. But he was in a good mood, nonetheless. “If I turn this baby up I’m going to win!” Asekhuano half-joked with a runner zipping past him. Asekhuano was diagnosed with colorectal cancer in February 2017 after he followed up with his doctor on gastrointestinal distress he thought was related to side-effects from a psoriasis medication he’d started three months before. About 45 supporters — from CISCO, Asekhuano’s amateur hockey team, other friends, his wife Jackie, their six-year-old son Liam, their extended family, and Jackie’s co-workers — joined his Cross-Check Your Colon team. The name was created both to acknowledge Asekhauno’s love for hockey — he’s the goalie — and to raise awareness for getting a colonoscopy. The first-time team raised $3,260, the fifth highest team total for CRUSH this year. Fee Fighters!, a 50-person-strong team formed last year in support of Mary Beth Fee’s fight against colon cancer, was again the top CRUSH fundraiser. They raised $7,575. Fee, a wife, mom and friend “known for her kindness and generosity,” participated in last year’s CRUSH event, but passed away in December. When the Fee Fighters! were announced as the winning team, screams erupted. An exuberant group of young boys rushed the stage. Among them were Mary Beth and Frank Fee’s two smiling boys, Callin and Ryan, who accepted, on behalf of the team, a blue marble trophy. Fee Fighters! team captain Frank invited his wife’s doctor Hope Uronis, MD, and physician assistant Margot O’Neill to join the group photo. Angela Bowling, a marketing manager at Duke Stores and a four-year survivor of stage four colorectal cancer, was the top individual fundraiser; raising more than $1,205. Her team Bum-ble-Bees was participating for the fourth time at CRUSH. “I hope to make it five next year !” Bowling said of both her survivorship goal and her plan to do CRUSH once again. Circle photo (top): Callin Fee (center) celebrates with his teammates the Fee Fighters! being named top fundraising team for CRUSH 2018. The team was formed last year to support his mother's fight against colon cancer. Hope Uronis, MD, and Margot O'Neill, PA-C (at back center and right), who treated Callin's late mother, were invited to join the photo.